About us | Strojírna Soběslav s.r.o. Our company has been operating on the machine engineering market since it was founded on the 1st of April 1994. Our original goal was to be a sought-after supplier of machines and machine parts in the field of custom manufacturing. Our goal has not changed since then, and we believe that we are fulfilling it successfully. In the future, our aim will be to offer coherent and quality solutions of specific machine engineering projects that meet the needs of our customers. Building of trustworthy relationships with cooperating companies and suppliers is also an inseparable part of our philosophy. Our team consists of about 45 qualified specialists, who, thanks to their experiences and modern machinery, are capable of ensuring the completion of orders in the technology, production and assembling areas. Final inspection of the product including measuring protocols and required tests, its packaging and expedition are also a part of the process,. We have been proud owners of the certificate of the Quality System since 2005. Contract with the “Werag GmbH” company regarding the exclusivity in manufacturing of mechanical parts for single-purpose machining devices. Termination of the cooperation with “Werag” company as a result of its unexpected bankruptcy which caused our firm a great economical loss. Initiation of a long-term cooperation with companies such as “Mauser Werke Oberndorf Maschinenbau GmbH” , “INA- Schaeffler KG” and “KHP kovoengineering”. Owners of the “Strojírna Soběslav” company are buying the rented “Lada Soběslav” manufacturing spaces. Gradual increase in the number of workers and stabilization of the company on the market. Manufacturing of a tube mill for calibration and straightening of metal sheets. Initiation of manufacturing a device for the production of Bevisol KTH spatial girders for the “Fert a.s.” company. Important internal restructuring of the company focused on improvement of the overall effectivity. Extensive reconstruction of manufacturing and administrative spaces. The company was, as well as all of mechanical engineering, affected by the financial crisis. Manufacturing was restrained and precautionary measures were taken in order to ensure more effective functioning of the company in difficult conditions. The first horizontal boring machine MICROCUT was bought as a part of European projects. It was the HBM 5 T machine, which meant an essential qualitative change in the machining process. Assigned workers are gradually trained to operate the new machine and used tools are being substituted. Modernization of the company continues. The 3D measuring machine Zeiss is reconstructed and the new Calypso measuring software is installed, which enables issuing of the measuring report in several languages. A machine WFC10CNC is bought from the “Fermat” company at the end of the year. That signified a gradual progress on the pathway to the machinery modernization. Reconstruction of the main building. It got a new look after a complete roof and facade reconstruction. 2 new project from European funds are initiated. 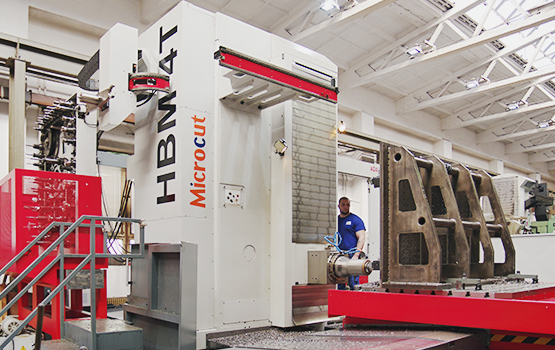 Another 2 new horizontal boring machines – MICROCUT, HBM4T – are bought in this year. For “Strojírna Soběslav s.r.o”, the year 2016 was a year of stabilization and a team effort to to handle the ever more challenging demands of our customers to our best abilities. We put great emphasis on quality, flexibility and efficiency of the production of the more and more complex and precise products, those being the singular sections or coherent machine units. “Strojírna Soběslav” celebrated the 20th anniversary of it’s existence in 2016. During this time, it has made a good name for itself on the market and – thanks to its precision and quality production – it has gained a lot of other customers, among which many are important industrial companies. Our regular customers and our experienced team are the best guarantee for good stability and further successful growth of our company. The project entitled "Innovation processes in the machining of large parts," is co-financed from EU funds. As the competitiveness of the company on the local market and abroad (mainly Germany) must be taken into account, the innovation of production becomes one of the priorities. Therefore, the acquisition of the following technologies, as well as adoption of innovative measures are a necessity. The project entitled "Development of Technology in Strojírna Soběslav" is co-financed from EU funds. The project goal is the acquisition of a new horizontal boring machine and the construction of its foundation under. The motive behind the acquisition is the plan to expand the production capacities and modernize operations. It is an extension of the technology due to cover the increased requirements of our customers. The project titled "Research, development and innovation in machining" is co-financed from EU funds. – Research and development activities, including innovations aimed to increase the efficiency of technological processes during machining, focused on reducing the overall machining times, number of operations and improving the living and working environment during machining. Such innovated processes shall be applied in manufacturing of machines and machine componenets. This project is co-financed from EU funds and the ESF. The project focuses on training employees in order to increase the adaptability and business competitiveness through increasing the knowledge, skills and competencies. Objectives of the project are based on the needs of handling with the progression of technological development and qualification requirements of employees and to increase the proportion of clients from abroad after Czech Republic joins the EU. Handling of PC I., II. The trainings are to be attended by all company employees.